Each Basket Starter biscuit contains beneficial microbes and slow release fertilizers to help feed your baskets all summer. 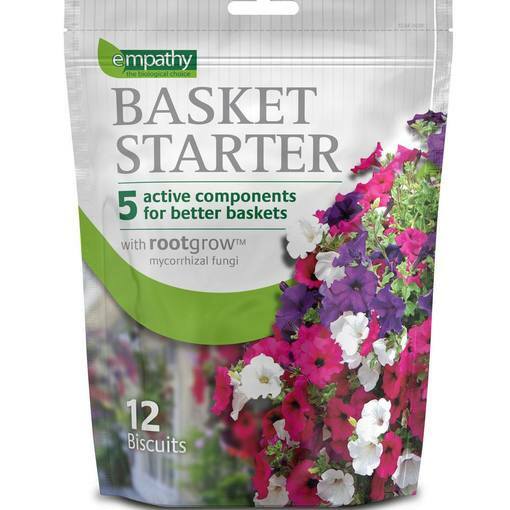 Empathy Basket Starter is 100% peat free and guaranteed to improve drought resistance. It provides an enhanced natural vigour to all plants and bulbs and is environmentally friendly. See Planting and Growing Instructions below for application details. Place each biscuit at mid soil depth and apply two biscuits per small basket (around 4-7 litres) and apply three to five biscuits per large basket (around 7 litres+).